Passing of Bro. James Clark, PM (1974). on 9th January 2018 of PM (1974) Bro. James Clark . deep condolences to Jim's Wife and Family. A special meeting hosted by Lodge Gleniffer No. 1219 on Tuesday, 30th August, attracted more than seventy Brethren from within and outwith the Province. The occasion was the arrival of the Travelling Maul – a recently formed “Tuesday Club” held only on the 5th Tuesday of a month allowing lodges that hold regular meetings on that day of the week to get together. The RWM of Lodge Gleniffer, Bro. Archie Henderson welcomed SPGM Bro. Willie Fleming and a Deputation headed by RWM of Lodge St Columba Govan No 729, Bro. Tom Robertson, accompanied by the RWM of Lodge St John (Kilwinning) Largs No.173, Bro. Les Pearson, both “Tuesday Club” lodges. A further eight RWMs attended the meeting. A FC Degree was then conferred on Lodge Gleniffer’s latest EA, Bro. Alexander Forbes, by the degree team of Lodge St Columba Govan with the Obligation given by RWM Bro. Tom Robertson. The harmony that followed included a superb buffet supplied by the Brethren of Lodge. SPGM, Bro. Willie Fleming, representing PGM Bro. John S. Miller, congratulated Lodge Gleniffer for hosting the meeting adding that PGLRE was very keen to promote this sort of event. The history of the Travelling Maul itself was later explained by RWM Bro. Archie Henderson who found it lying among rubbish at Glasgow’s Shieldhall Recycling Centre where he works. He said: “There was no indication of where it had come from or who had put it there, but I saw it was a very heavy and solid piece of wood and realised its possibilities so I took it home and cleaned and polished it. It is with the deepest regret that I have to announce that PM Duncan Robertson passed away on Saturday 23rd July. Duncan's funeral will take place this Friday 29th July with a service at 10:45 am in St James's Pollock Parish Church, Meiklerig Crescent, G53 5NA and thereafter to Craigton Crematorium ( entrance off Paisley Road only ) at approx 11:30 am. Please pass this sad news to anyone you think may have known Duncan. Our thoughts and prayers go to Duncan's widow Jean and her Family. The Funeral of Bro John ( Jackie ) Gray took place on Thursday 7th July at Craigton Crematorium. On behalf of the Lodge I would thank the 11 Brethren who attended, especially at such short notice and during a working day and a holiday period. Many more Brethren sent an apology. On arrival at the Crematorium the Brethren of the Lodge Members were asked by Jackie's Family if they would be Paul Bearers. The eight who did so were very honoured, something I am sure Jackie would have approved of. The service was conducted by Bro. Rev'd Brian Casey of Springburn Parish Church. It is my intention to mark this sad event at our first regular meeting on September 15th. It is with great sadness that I report the death of one of our Members. Jackie only joined St Columba, Govan No 729 on 23rd September 2015, receiving his Mark on 12th April this year. He was very well received by all members of our Lodge and his musical talents were greatly appreciated when he entertained us at our Harmonies with his singing and Guitar playing. Jackie was a very keen member and enjoyed his new found involvement in the Craft. He was a very quiet, likeable Brother and I regret, as I am sure do the members of 729, not being able to get to know him better. Our condolences go to his Family and friends. On behalf of John’s Family I would like to inform you his Funeral will be held this THURSDAY, 7th JULY, in CRAIGTON CREMATORIUM, at 14:30 pm. It is with deep regret that we have to announce the death of Past Master Bro. John Weir. John was initiated on 12th January 1965, Passed on 23rd March 1965, Raised on 25th May 1965 and received his Mark on 25th January 1966. and was Right Worshipful Master in 1972/73, continuing for many years after as Lodge Treasurer. Our deepest sympathy to John's wife and Family. The Members of the Lodge met for a short business meeting which was followed by a superb Ladies night. The Brethren were accompanied by their family and friends and enjoyed an excellent Disco Dance and entertainment from one of our newest members, Bro. Jack Gray who accompanied himself on Guitar. A new talent discovered. I am looking forward to more of the same at some of our Harmonies. Each of the Ladies received a small gift from the Lodge and were thanked by the RWM not only for their attendance but for their supoport to the Brethren throughout the year. Can I give a very big thank you to all the Ladies who supplied the Buffet and to Bro. Jim Carson for all his hard work in purchasing the gifts, gathering the prizes, and organising the Raffle and to all the Brethren for their contributions. The Brethren of St Columba, Govan No 729 held our Annual Installation of Office bearers. On the evening we were joine by over 90 guests including members of the Provincial Grand Lodge of Glasgow, Headed on that occasion by Substitute Provincial Grand Master Bro. Gordon Heggie and joing his deputation was The Provincial Grand Master of Renfrewshire East bro John. Samual Miller and Past Provincial Grand Master of Renfrewshire East Bro. Frank Johnstone. The Brethren and guests joind in harmony after the meeting. Thank you to all who worked very hard to make the evening such a success. First Meeting after Christmas Holidays. Our First meeting after the Christmas and New Year Holidays will be held on Tuesday 13th January 2015, and will be an Entered Apprentice Degree carried out by our Degree Team on our newest Entrant. The Lodge will Tyle at 19:30pm but would all Office Bearers please note we will have an Enquiry Meeting at 19:00pm for our latest Applicant. His Proposer and Seconder have been notified. The Rergular Meeting on Tuesday 23 December 2014 will, by agreement with PGLGW, be cancelled due to its proximity to Christmas. On behalf of our Right Worshipful Master, his Worshipful Wardens, Past Masters, Office Bearers and Brethren, may I wish you and your Family a very Merry Christmas and a Happy and Healty New Year. Haste Ye Back. The Brethren of Lodge St Columba, Govan No 729 met for a Regular Meeting ( Business only no Degree ) at 19:30pm on Tuesday 9th December 2014 and at the close of the meeting held our Annual Ladies Night. Thank you to everyone who supported the Lodge on that evening, to our Ladies for joining us and for having provided us with lovely food, to our Senior and Junior Deacon for all their hard work in organising the Raffle, to all the Brethren who provided Raffle Prizes and to our RWM for his Hospitality including lovely gifts to our Ladies. A deputation from the Brethren of Lodge Friendship No 1712, led on this occasion by their newly elected Right Worshipful Master, Brother Dale Hall, visited us tonight for the purpose of conferring the Mark Degree. Brother William Gordon Hedley McVicker and Brother Alexander MacLauchlan were advanced to the rank of a Mark Master Mason. It was an excellent degree carried out by the Office Bearers of 1712 led by the conferring Mark Master Mason, Brother John McLean PM. The Right Worshipful Master, Bro John F. Haining, led a deputation to Lodge Philanthropic No 304 EC for the purpose of presenting a 50 Year Certificate to one of our Life Members, Bro. Robert Lyons Marshall who had affiliated, many years ago, to that Lodge. The deputation was joined by Bro. Robert's sibling, Bro. John Marshall who is also a life member of our Lodge. Worshipful Master Bro Tettley invited each member of the deputation to join him in the East.. The Lodge was recessed to allow many of Roberts friends and family to witness the presentation of Certificates, by our RWM, on behalf of the Grand Lodge of Scotland, together with a Certificate from the Provance of West Yorkshire, presented by Assistant Provincial Grand Master Bro Anthony W. Llewellyn. Bro Llewellyn also Presented Bro. Robert with a Certificate from the West Riding Charitable Association in recognition of his outstanding contributions to that Association. Bro Robert truly displays the lesson he learned in his first entrance into his Mother Lodge those 50 Years agol. It was remarkable to discover that Bro. Robert was one of 5 candidates who were entered on 22nd September 1964. On that evening our RWM was also entered, and in fact was passed, raised and advanced on the same dates as Bro. Robert. We did not disclose this information to either Bro. Robert or our RWM until we were about to enter the Lodge, However our RWM displayed his considerable skill in public speaking by thinking on his feet and entertaining the assembly with some very humorous jokes and stories, one even relating to his time serving with The Glasgow Police, when he had occasion to visit Bro. Robert's Electrical Contractors Business, in Govan, as a result of a fire. ( Our RWM's investigations subsequently proved the fire was due to the work of Vandals and NOT electrical ). The look on Bro. Roberts face when the story was told was just priceless. We were on this occasion accompanied by our Wives and the evening culminated in joining the Lodge members in their Festive Board where we were most generously wined and dined, courtesy of Bro. Robert, WM Bro.Tetley and the Brethren of 304. All in all a SUPERB visitation, a huge thank you to everyone Lodge Philanthropic 304 for making us most welcome. 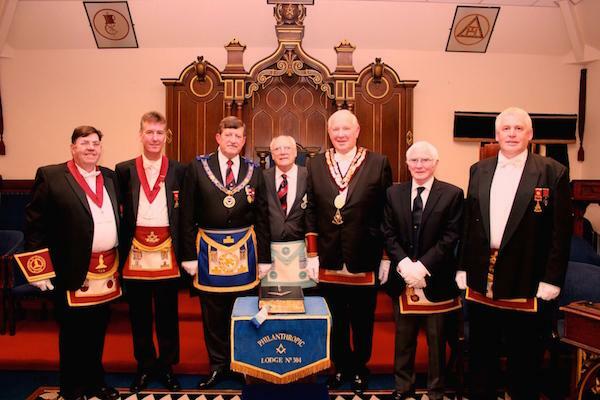 On Tuesday 23rd September 2014 the Provincial Grand Master headed a Deputation to our Lodge. Brother Henderson presented a Jubilee Certificate to our Right Worshipful Master, Brother John Forsyth Haining. After the presentation, Lodge Possilpark No 1330 carried out a superb Mark Ceremony and advanced Brother Richard Haining, the son of the Master, to this Rank. Thanks to PGLGW for picture and article. Full results of individual outings can be viewed on PGLGW Web Site. Use Link on our Links Page. Full results of individual outings can be viewed on PGLGW Web Site. Use on our Links Page. 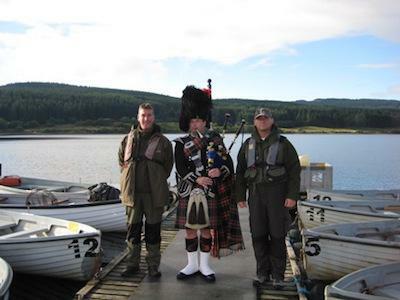 Heaviest Trout and winner of Alexandra Cup Bro Frank McCafferty of Lodge St Columba Govan No 729. Champion Lodge Lodge St Columba Govan No 729. Runners up Lodge Alexandra No 1282. Individual Champion and winner of Aurumn Cup Bro. 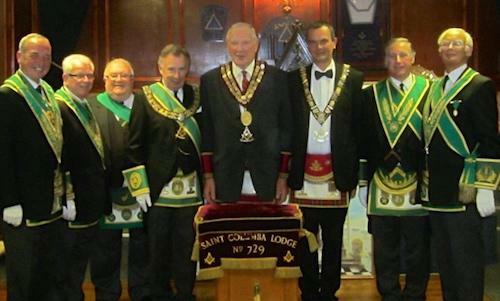 Ian Hillcoat, Lodge St Columba Govan No 729. Individual runner up and winner of Silver Cigaret Box Bro. Hugh McAlpine, Lodge Neptune No 419. Heaviest Trout and winner of Alexandra Cup Bro. Gordon Chapman, Lodge St Columbaq, Govan No 729. PGLG Champion Lodge Lodge St Columba Govan No 729. PGLG Runners up Lodge Alexandra No 1282. PGLG Individual Champion Bro Derek Chapman Lodge St Columba Govan No 729. PGLG Heaviest Trout Bro Jim Morrison Lodge Alexandra No 1282. Mr Ivan Jensen guest of Lodge Neptune No 419. Mr Glen Hodgkinson guest of Lodge St Columba Govan No 729.